In which I discuss my history of word phobia: Big or little scary words that I used to find hard to commit myself to saying, and the reasons why. Who would have thought that a child could be scared of words. After all, 'sticks and stones' and all that. And yet, I still remember how hard I used to find it to bring myself to utter certain words. And so I bid you welcome to my childhood world of word phobia. There were only a few words that challenged me, and it wasn't that I couldn't pronounce them, Oh no! The problem lay with my mental relationship with the words themselves. And so it's time I dealt with the beast and put pen to paper to get to the bottom of this. 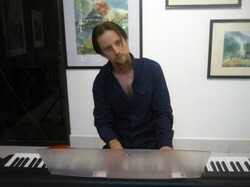 The story follows after this, my little interlude at the piano. Sometimes as a musicain, I like to get away from words altogether and just express myself with notes. Ah the wonder of improvisation! Let me take you back in time . . . To the distant realm of my childhood. It’s 1995, Wimbledon tennis champion Martina Hingis is still unknown, you’ve long since been able to jump on a dinosaur named Yoshi, and ‘school is in’! I didn’t much like school since boys and girls could be cruel to each other at that age, at least that was my experience. Adolescence might be a time of exciting experimentations, but it’s also a time of utter confusion and raging chemicals rushing around inside of you. Wether my problem with ‘eggnog’ could have been attributed to the aforementioned chemical surges, also known as hormones, I have no idea. I should state here, that I had nothing against the drink itself (I don’t think I’ve ever drunk one single glass of eggnog in my life; I was more of a ‘Bristol Cream Sherry’ child. Alas, it was the word that I had a problem with! You see, there were certain words that, as a teenager, I just could not get along with, and ‘eggnog’, strange as it might seem, was one one of them. This word made me cringe and feel desperately awkward (I’ll expound on this later). Now, I know what you’re thinking . . . and it’s true: opportunities to hear or use the word ‘eggnog’ were (are) exceeding rare, so why the concern? Well, unfortunately the problem seemed to ruminate from the word ‘egg’, a word that, comparatively speaking, has always been in much more common usage, and it’s frequency of appearance in day-to-day conversation proved, at the time, to be the real bane of my social existence. At breakfast time, much to the bewilderment of the catering staff, I’d find myself in the school canteen, pointing at the yoke-centred little monsters and saying . . .
Woolworth’s and other retail outlets dealing in chocolate confectionary, became no-go-zones at Easter, and since ‘Sonic the Hedgehog’s’ arch nemesis ‘Dr Robotnic’ had been renamed ‘Dr Eggman’, talking about ‘Sega’ had become increasingly difficult too. The one saving grace is that by secondary school, you no longer had to do egg and spoon races. It was a strange phenomena, how a simple noun could have such an effect on a human being. But it did. It made me extremely squeamish, and adding the word ‘Nog’ on the end just exacerbated the problem and sent me over the edge. Variations on the form of the word ‘egg’, such as the adjective ‘eggy’, really did me no favours either. The day came when I made the mistake of telling a best mate of mine about my problem. I recall this day vividly. I was having the conversation with him whilst sat on a pile of milk crates stolen form the school canteen. We were revising for biology and Len was looking at a diagram concerning ovulation and said the trigger word ‘egg’. I flinched in a manner normally reserved for coming into close contact with Peter Moore on one of his bad dandruff days. What did you do that for?’, asked Len. ‘What?’ Len flashed me a confounded stare, before continuing. I took a deep breath and ventured to spell it out. ‘The E. G. G.’ Word’. Well, it wasn’t long after that conversation with Len that everybody at school started on me with the word, and I’m sure they thought they were all pretty clever! But, you see, what they didn’t realise at the time (and still don’t realise today) was that by saying the word ‘egg’, it wasn’t making me feel bad about myself: it was making me feel embarrassed for them, because by the very act of breathing that word they were making themselves look . . . Ugly. It’s not that I was wanting to be superficial, I’ve never really been into ‘looks’, (although Minnie Driver on a park bench, staring through a shock of curly locks whilst pouting at the ducks does really work for me! ), But saying that word was a bit like bowing to the queen and smiling at her with spinach between your teeth. That was it! It was the ‘Meeting the Queen with Spinach-teeth Syndrome’. I tried explaining all of this to a leading Homeopathist many years later . The visit to his clinic was in a bid to try and understand why, at aged twenty-three, I was having lung problems, and he prescribed me a small bottle of something or rather (it didn’t have any ‘egg’ in the ingredients). Anyhow, I suppose I’m writing this now as a kind of closure to this whole deeply unfortunate episode of my life – suffice to say I got over the whole thing an age ago now. So all that remains to be said is to raise your glasses in a hearty toast . . .
. . . ‘To the ‘eggnog years’’. There, I said it again. ‘Eggnog’, ha, whose got the last laugh now, you. . . I will say you name!